1891年のアッチソン・トピカ・アンド・サンタフェ鉄道路線図、出典：Grain Dealers and Shippers Gazetteer. ^ Quickfacts.census.gov - Chase County - accessed 2011-12-06. 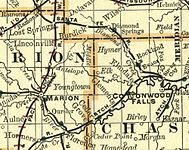 ^ American FactFinder - Cottonwood Falls, Kansas - accessed 2011-12-06.